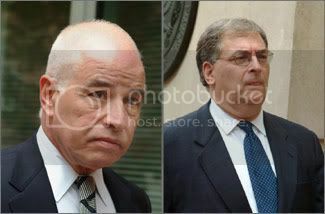 A federal judge has given a green light for the trial of former AIPAC officials Steve Rosen, left, and Keith Weissman, right, to proceed. WASHINGTON, Aug. 23 (JTA) — A new pretrial ruling in the classified-information case against two former pro-Israel lobbyists raises new questions about what defines a “foreign agent” and whether the government has the right to spy on lobbyists. Ruling on whether a wiretap order was legal, Judge T.S. Ellis III said there was “ample probable cause to believe” that two former employees of the American Israel Public Affairs Committee were “agents of a foreign power.” The ruling was handed down last week and declassified Tuesday. Ellis also said that “collection or transmission of material that is not generally available to the public” qualifies as an activity that could merit wiretapping under the Foreign Intelligence Surveillance Act, or FISA. Ellis, a federal judge in Alexandria, Va., ruled on a motion to suppress the FISA-obtained evidence, filed by lawyers for Steve Rosen, AIPAC’s former foreign policy director, and Keith Weissman, its former Iran analyst. The defense contended that, as lobbyists, Rosen and Weissman do not qualify as the type of major threats to U.S. security that the system was designed to rout out. The ruling could have far-reaching implications for how AIPAC functions as a lobby and how lobbyists, journalists, academics and other non-governmental researchers gather information. If it emerges at their trial that the activities that earned Rosen and Weissman the surveillance act warrant were part of their AIPAC routine, the organization could face renewed efforts by critics to force it to register as a foreign agent. “This is something that people following this case have always realized is a potential problem,” Neal Sher, a former AIPAC executive director, told JTA. AIPAC officials refused to comment. Forcing AIPAC to register under the act, which has notoriously burdensome reporting requirements, would considerably restrict the group’s ability to lobby and maintain its formidable reputation for secrecy. A source close to AIPAC said the organization was not concerned. Ellis’ ruling doesn’t specify what actions merited the surveillance act warrant, but the source said they probably relate strictly to Rosen and Weissman, not to any acts routinely carried out by AIPAC staffers. The source noted that AIPAC’s critics for years have called for the organization to be registered as an agent of Israel. AIPAC says the policies it promotes are first and foremost in America’s interests. Prosecutors have emphasized that neither AIPAC nor any of its current employees are under suspicion. Attorneys for Rosen and Weissman refused to comment for this story, and prosecutors did not return calls. receiving information on Iran and terrorism. Free-speech advocates, already alarmed by the prosecution’s unprecedented use of a 1917 statute that criminalizes the mere receipt of classified information, found new grounds to worry in this ruling. Steven Aftergood, who heads the Secrecy Project for the Federation of American Scientists, a nuclear watchdog, said he was alarmed by Ellis’ classification of the “collection or transmission of material that is not generally available to the public” as meriting a surveillance act wiretap warrant. Jewish community leaders were cautious about the ruling, noting that pretrial decisions do not accrue the heft of legal precedence until the trial is over and appeals are exhausted. Hoenlein said, however, that he was gratified that the opinion elites, including editorialists and lawmakers, were joining the Jewish community in understanding the far-reaching free-speech implications of the case against Rosen and Weissman. Separately, Ellis ordered an inquiry into the leak of the FBI investigation two years ago. Television cameras were positioned outside AIPAC headquarters ahead of an FBI raid on Aug. 27, 2004. CBS News correctly reported at the time that the case involved wiretaps.